When ham radio talk turns to getting a signal out, the old adage "It's hard to beat a wire" usually rings true and around Nye County, the wire to beat is the 1600 ft loop antenna of W6OBB. Perched 75 feet above a five acre lot this skyhook gets the job done for veteran broadcaster Art Bell. 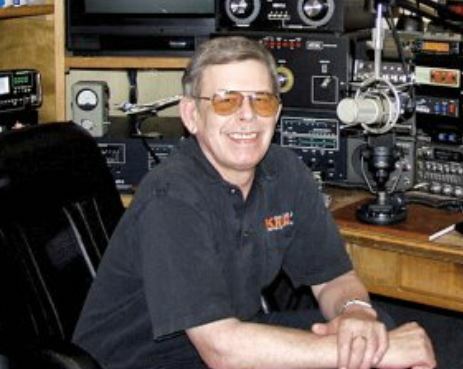 Art, who has been an active amateur radio operator since 1958 is best known as the founder and host of the nationally syndicated radio show "Coast to Coast AM" and as the founder of KNYE radio in Pahrump. Art Bell-W6OBB hanging around "the shack"
Art, began his broadcasting career like so many others in the industry, by spinning records. broadcasts, which originated from KDWN (K-Dawn) in the Plaza Hotel, were garden variety political formats. Art moved his studio to his home in Pahrump and the show began to explore conspiracy theories, the paranormal, and other super-natural topics. These topics help to propel Art to the top of broadcasting with a nightly listenership of more than 15 million. Changes in Arts family and personal life, coupled with retirement prompted Art to relocate to the Philippines for several years. It's reported that an improved immigration status for his wife and a longing for his Nevada antenna farm and ham station prompted his return to Pahrump in the summer of 2011. For the next two years rumors of Arts return to broadcasting came and went. 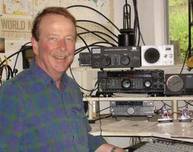 His only radio involvement appeared to be his continued appetite for Amateur Radio. Last week Art publicly announced that he had struck a deal with the SiriusXM satellite network for a regular night time show to be named "Art Bell's Dark Matter". A three hour program beginning at 7PM PST, the show will air live Monday thru Thursday with an encore show on Friday nights. Beginning September 16th you will find Art on the Indie Talk Channel #104. W6OBB's new QRP signal will travel more than 23,000 miles and be S9 across the entire country......even his giant loop can't do that. Both ARRL Pacific Division Director Bob Vallio-W6RGG and Vice-Director Jim Tiemstra-K6JAT will serve an additional term in their respective offices. With no opposition candidates stepping forward, the two officers have been declared elected and will retain their leadership positions for an additional three year term. Valio became the Pacific Division Director in February 2003, following the death of then Director Jim Maxwell-W6CF. He was returned to the Directors position in 2004, 2007, and 2010. Tiemstra was appointed Vice-Director in June of 2009 following the resignation of Andy Oppel-N6AJO. He gained a full three year term in 2010.